No turtles recognize political boundary lines, so you won't find any turtle species that lives exclusively in Oklahoma. You will find 17 species of turtles that include Oklahoma a part of their habitat, and of these, 15 species are aquatic. The Oklahoma turtle population represents four different families, including Kinosternidae, the mud turtles; Emydidae, which includes box turtles, map turtles and basking turtles; Trionychidae, the soft shell turtles; and Chelydridae, which are large carnivores. Two members of Emydidae, the ornate box turtle (Terrapene ornata) and the three-toed box turtle (T__errapene carolina triunguis), are terrestrial and are often kept as pets. All the others live in the streams and lakes of the Sooner state. The four members of Kinosternidae that live in Oklahoma have an important feature in common – they protect themselves by being smelly. Two are known as mud turtles because they inhabit muddy stream beds and irrigation ditches, and two are known as musk turtles, because they have to ability to emit a foul odor when threatened. One species, the common musk turtle (Sternotherus odoratus) is so well known for this ability that its nickname is the stinkpot turtle, but all members of this turtle family can do the stinkpot thing. One of the rarest of Oklahoma turtles, the razor-backed musk turtle (Sternotherus carinatus) is a small turtle. In fact, all members of this family are small. The yellow mud turtle (Kinosternon flavescens) grows to a maximum length of 5 inches, and the Mississippi mud turtle (Kinosternon subrubrum hippocrepis), which inhabits the eastern portion of the state, does not even achieve that length. These turtles have smooth shells that are largely unmarked, although the shell of the razor-backed musk turtle has a well-defined fringe. If you're walking near a stream in eastern Oklahoma, you may come across one of the three species of map turtles found in the state. The three are the common map turtle (Graptemys geographica), the Ouachita map turtle (Graptemys ouachitensis ouachitensis) and the Mississippi map turtle (Graptemys pseudogeographica kohnii). They are easy to recognize becauseof the markings on their shells that resemble maps. All three belong to the family Emydidae, which also includes four species of basking turtles, which are known for their habit of basking on large rocks and logs near streams and lakes. 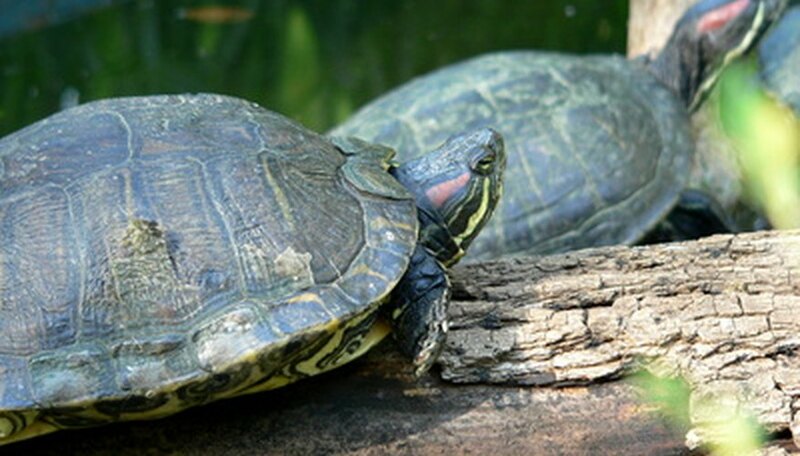 The painted turtle (Chrysemys picta) is smallish and has yellow or red markings on its mid- to dark green shell. The rare western chicken turtle (Deirochelys reticularia miaria) is about 5 to 9 inches in length and also has a green, pear-shaped shell with yellow stripes on its head, legs and neck. The eastern river cooter (Pseudemys concinna concinna) is largish, reaching a length of up to 13 inches. It also has yellow stripes on its legs, neck and head, but its shell is also full of C-shaped yellow markings. Finally, the red-eared slider (Trachemys scripta elegans), which grows to about 9 inches in length, prefers slow-moving streams and ponds. It has a red patch of skin behind each eye and is the most common turtle in Oklahoma. You might have trouble spotting specimens from either of the two species belonging to the Trionychidae family, even though they are fairly large, reaching lengths of 15 to 20 inches. They are almost always found in shallow water, and they like to submerge themselves in the mud and extend their necks so that only the head is above the water. They have brown shells covered with leathery skin and a yellow stripe on each side of the head that extends through the eye. The difference between smooth softshell (Apalone mutica mutica) and the spiny softshell (Apalone spinifera) is that the latter has spiny projections on the front edge of its shell. Its smooth-shell counterpart has no such spines. The two representatives of the family Chelydridae are also the two largest Oklahoma turtles. The common snapping turtle (Chelydra serpentina) can reach a length of 18 inches and weigh between 35 and 50 pounds. It has a dark gray to light brown shell and greenish gray to black skin. The alligator snapping turtle (Macrochelys temminckii) often weighs in between 80 and 100 pounds and can be more than 2 feet long. Its shell and skin are dark brown, and the shell has three prominent ridges that run from front to back. Whereas the common snapper might be founds in streams, sloughs and ponds, the alligator snapper almost always prefers flowing streams because the turtles have a hard time traveling on land. Deziel, Chris. "How to Identify Oklahoma Water Turtles." Sciencing, https://sciencing.com/identify-oklahoma-water-turtles-6811250.html. 23 August 2018.